We did it...we bought a second car. We bought a used, I mean "pre-owned", Volkswagen Golf. It's a nice little car and, though I haven't driven it yet, I am told that it is zippy. My girlfriend cited many wonderful things about the car...not least of which is that the odometer is in kilometers rather than miles. This brings my European gal pal great joy. 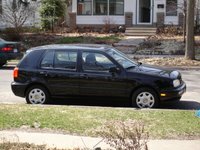 We bought the car in Hudson, Wisconsin and as I followed Luisa back to Minneapolis, I could see her singing and doing a little dance in the Golf. I could see her joy from the car behind - that's some joy. There is no doubt that the second car will make our lives easier or, at least, more flexible but the car cannot go grocery shopping by itself which makes it a little less useful than I would like it to be. In last week's episode, our heroine (Vikki) is betrayed by two of those closest to her. Her partner (Luisa) dared to say that all the Peep talk was driving readers away from this blog. 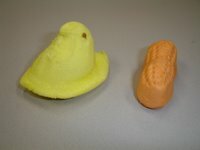 Then, a so-called friend (Kristin) compared Peeps to Circus Peanuts. Circus Peanuts people! The differences are stark, no? The Peanut does not glisten like the beautiful peep. The Peanut has neither beak nor cute tail. The Peanut has no personality. Then, there is the taste. While I don't eat a lot of Peeps, I am not repulsed by the thought. I would never eat a Peanut - they smell like the bottom of my grandmother's purse...kleenex and lipstick. Let's take a poll - Peeps or Peanuts? I am not sure that the "Vikki/NPR/Gallup Poll" can have one of the sponsers voting.I vote for dental surgery. Circus peanuts are a plant by the government. There are strange chemicals in them that make you carry kleenex in your purse. Lipstick stained kleenex. Beware. Beware.Peeps, of course, although I wouldn't eat one if you paid me.Oh, and kilometers. I had never seen a Circus Peanut until now. It looks absolutely inedible. But I love the new previously owned car! 1)Leigh - I don't get a lot of comments so don't take it personally. Thanks for your comments - I appreciate them!2)Susan - "Oh, and kilometers" I'm not sure I get that part of your comment.3)I drove the car tonight and I really like it. It's a fun little car.